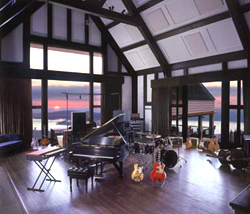 The Most beautiful destination recording studio in the world. Welcome to Allaire! Allaire is located two hours north of New York City and is accessible by car, bus or train. The studios are the creation of photographer/musician Randall Wallace and are situated at Glen Tonche, a stunning mountaintop estate built in the mid-1920’s by Raymond Pitcairn. There are three studios at Allaire: the Great Hall, with its sweeping views of the Catskill Mountains, will house an eighty input navy blue SSL 9000J console; the Neve Room, which overlooks New York’s Ashokan Reservoir and the Pro Tools-equipped Project Studio. Since opening, Allaire has hosted artists such as David Bowie, Norah Jones, Tim McGraw, Dar Williams, the Gipsy Kings, My Morning Jacket, Donald Fagen, Jason Mraz, Audra McDonald, Staind and many others. Allaire represents a different approach to record production, combining studios, first class accommodations and dining as well as a staggering array of instruments and recording gear under one roof. Allaire is a residential studio offering finest equipment (new and vintage), great sounding rooms and full-time technical support. The comfortable and tastefully furnished accommodations include tennis, heated pool, jacuzzi, archery, hiking and a game room with over twenty pinball and arcade games! The on site chef can prepare delicious meals tailored to suit the specific taste of each client. 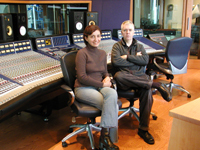 Veteran engineer/studio manager Mark Mckenna and his superb staff look after some very special artists who have recorded/mixed there -- Norah Jones, David Bowie, just to drop a few names! Craig Street with engineer Husky Hoskulds had just finished mixing the Gipsey Kings and were thrilled with the sound of the SSL 9K. The production team used the Great Hall itself as a live reverb chamber, making use of the room's nearly 90,000 cubic foot volume for natural reverb. A smaller space, the nearby men's room, was also used as a chamber; watch out - even the bathrooms can be mic'd up at Allaire! Craig and Husky dug the Augspurger monitors, and the dinners at sunset weren't bad either. Tim and Neil Finn (of Split Enz and Crowded House fame) brought their band (and families) all the way from New Zealand to Allaire for a month's work with famed producer/arranger/engineer Tony Visconti and engineer/Pro Tools operator Mario McNulty. Tim, Neil & Co. made use of the Neve Room for tracking before moving to the Great Hall to complete overdubs. 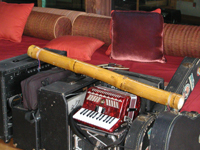 The artists and producer made use of Allaire's extensive instrument collection to enhance the recording; Banjo, mandolin, cello, upright bass, electric and acoustic guitars by Fender, Gretsch, Gibson and Martin, dulcimer, harmonium, mellotron, Vox Continental organ etc all made their way onto the tracks. 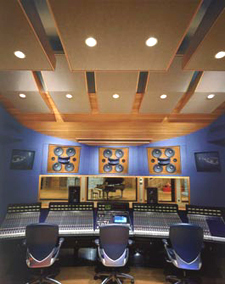 The Neve Room (pictured above) All activity in this studio takes place in a common area - there is no separation between performers and producer/engineer. This room features a classic Neve 8068 with Studer Gold Edition A-827 16/24 track recorders and a wide assortment of outboard gear and microphones. For the gear freaks, Allaire has upgraded one of its Pro Tools systems to an HD rig with two 192 I/O's, Sync I/O and Rosendahl Nanosyncs. They have also acquired a rare Dumble Overdrive Amp with Dumbleator. This amp is the choice of guitarists like Carlos Santana, Larry Carlton and Robben Ford and is one of the world's rarest and most sought after amps. In addition, Allaire hosts an instrument collection containing over 150 vintage guitars, 75 non-guitar string instruments, 50 guitar amps and 40 analog keyboards! Choice gear, great hospitality and the down-to-earth vibe of this studio coupled with the amazing views (high, about 2000 feet above sea level, overlooking this big reservoir. Look for hawks and eagles in the sky) is outstanding! The on-site accommodations are superb --chef on demand, exquisitely decorated bedrooms... Good going Mark and staff! If you don't have your directions to the place, there's always a freindly Britt fetching you to the hilltop mansion on Glen Tonche! Put this one on your must see list if/when recording near New York. It's only an hour away from the Big Apple near the artsy town of Woodstock. 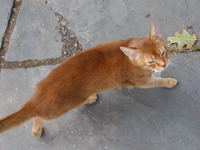 We enjoyed visiting the nearby historical village filled with great restaurants and galleries. Allair, Allright! 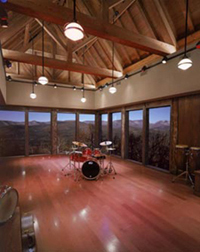 In 2005 Allaire's rooms have been firing on all cylinders and the studio continues to gain momentum with both its Neve and SSL rooms having been busy since the facility's opening. Legendary producer John Leckie, who has recently recorded at Allaire with the bands My Morning Jacket and Longwave, is drawn to the ambience and sonic excellence of the facility, calling its Great Hall control room "the best I've ever worked in." After a recent visit in April, producer David Kahne brought rock overlords The Strokes to Allaire, who are currently working on an upcoming RCA release. The band had been recording in their own rehearsal/recording space in NYC, but Mr. Kahne brought them to Allaire to lend some diversity to their guitar sounds. Allaire, which maintains an extensive instrument collection, owns about fifty vintage guitar amps (all meticulously maintained by chief technical engineer, Ken McKim) and over one hundred fifty guitars. Kahne also wanted to take advantage of the Great Hall's natural acoustics and the George Augspurger/John Storyk designed control room to precisely evaluate what the group had recorded in NYC. The engineer on the Strokes project is LA based engineer Rob Brill, assisted by Allaire's own Matthew Cullen. The project was recorded on a variety of formats including Nuendo, Logic HD and Pro Tools HD. Universal Music quartet The Working Title recorded their major label debut in April in the Neve Room with producer/engineer Brad Wood and producer David Bryson, who is also a member of the Counting Crows. Also lending his engineering skills to the project was Allaire's Damien Shannon. Meanwhile, Warner Brothers trio The Secret Machines chose Allaire for their second Warner Brothers album, with Allaire alumnus Brandon Mason engineering the project in the Neve Room. The band recorded basics on 2" 16 track analog utilizing one of the studios two Studer 827 Gold Edition recorders. Assisting on the project was Allaire's Scott Serota and Kaori Kinoshita. In March, ATO/RCA artists My Morning Jacket recorded their second album for the label in Allaire's Great Hall with John Leckie producing/engineering. The band tracked live in the Great Hall to 2" 16 track tape and remained in the analog domain for the duration of the recording. Engineering for the project was shared by Leckie and Allaire's Matthew Cullen.